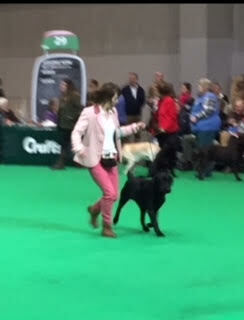 CRUFTS CRITIQUE:- “Magnavalleys Cornishman . A lovely balanced black , of good construction, carrying a correct double waterproof coat. He was shown in hard condition, good spring of rib & moved with drive off strong quarters “ …..
Our new little boy Finn, from Gracie ‘s second litter & such a sweet biddable little chap . He’s happy, confident, but not pushy and a tail that doesn’t stop wagging! He has started his ring craft training and taken it in his stride. We are hoping that he will join his big sister in the show ring later in the year . A super start to his show career , at his first open show he’s awarded Best Puppy in Breed & Best puppy in Group. He took the day in his stride & his tail didn’t stop wagging . At only his second championship show & a day shy of 7 mths old Finn has delighted us by winning his minor puppy class at Bath championship show & qualifying for Crufts 2018 , what a little star, we are so proud of this boy & another dream come true , another home bred puppy has qualified……..
Finn does it again by taking 3rd place in a super minor puppy class at Cotswold & Wyvern Labrador Retriever Club Championship Show & qualifies for Crufts 2018 . Finn had a fabulous day at our local Agricultural Show at Stithians, he won his class , & then went on to be awarded Best Puppy, Best in Breed & later in the day Best Gundog Puppy a huge achievement at only 8 1/2 mths . The judge thought he was stunning with huge potential . Finn has done it again at Paignton Ch Show, Bournmouth Ch Show , & South Wales Kennel Association Ch Show . He has now qualified five times for Crufts 2018 , all before his first birthday. Finn has had a fantastic 6 mths in the ring , being consistently placed at both open & Championship level. 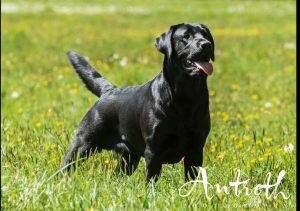 He has many Best Puppy, Best Of Breed & Group placings. Above all he has the sweetest of temperaments & is very much a mummy’s boy . We look forward to having him back in the ring in 2018,having taken time out while Florence was otherwise occupied with her lovely litter . Finn has had a super start to 2018 winning his classes in 3 Open shows that he entered , & gaining Best Of Breed under Margaret Barker (Deerbrook) at Ilfracombe & District , He’s still very enthusiastic !! & loves the attention he receives . He has also taken his role as ‘Uncle’ very seriously, & is very gentle with his new nephew Louis. Finn has had a fantastic start to 2018, winning most of his classes, Best Of Breeds & group placings at open shows. To top it all he’s qualified for Crufts 2019 at WELKS with 3rd in his last Junior class , all before 18 mths old.